I'll start the ball rolling here. I'd choose A. I don't know who's teaching our toddlers today but, as far as I'm concerned, there should be no such thing as an eensy-weensy spider. It's itsy -goddamn-bitsy. Can I get an amen on that?! Oh yeah, I also have a super-fast update on my previous Law of Attraction post. First, it does seem to be working. Last night, I went out to a bar and came home with more money than I left with (without hitting an ATM, that is)! That could be a first for me. Someone heard that I played piano & asked me to sit down behind the keys. Before I knew it, the crowd started tossing bills into a fishbowl. Played for a half-hour. Yeah, give me a few pints of the black stuff & I turn into a real crowd pleaser. But, isn't that remarkably odd? I make a statement on my blog and suddenly people are literally throwing money at me! I can totally identify with how strippers must feel now -- which, by the way, is pretty good. I know there are a lot of theories about stripping being degrading to women, yadda, yadda. But, have any of these theorists ever been surrounded by people tucking ones into their g-strings? I highly doubt it. Anyway, I heard that it's not enough to simply state what you want. Apparently, you have to talk about it as though it has already happened. Because, if I say that I have already made $1,000,000 this year, my brain knows that it is not true. And my brain doesn't like to lie (since I'm such a nice guy and all), so it works on converting these sorts of statements into truths. Therefore, going forward, when I speak of having made $1,000,000 in 2008, I'm conditioning my brain to believe it. The only problem I see with this is that, once I've actually made my $1,000,000 in 2008 (which, lets face it, I already have), how am I going to tell you about it without your thinking that I'm still in the "convincing myself" mode? 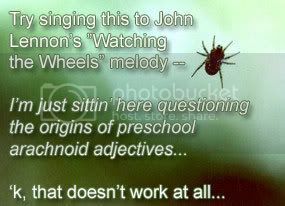 If I can add my itsy bitsy comment, eensy weensy must go. Merry Christmas and hope Santa tucks lots into your G string. Eensy weensy sounds pathetic. Itsy Bitsy is the only way to go.